This book is simple gorgeous. The words are the lyrics to the song by James Lord Pierpont. The pages however are beautiful!! Many have cuts that show the image on two pages. We tried to get a good picture to show you what I mean. See the tree in the photograph below. 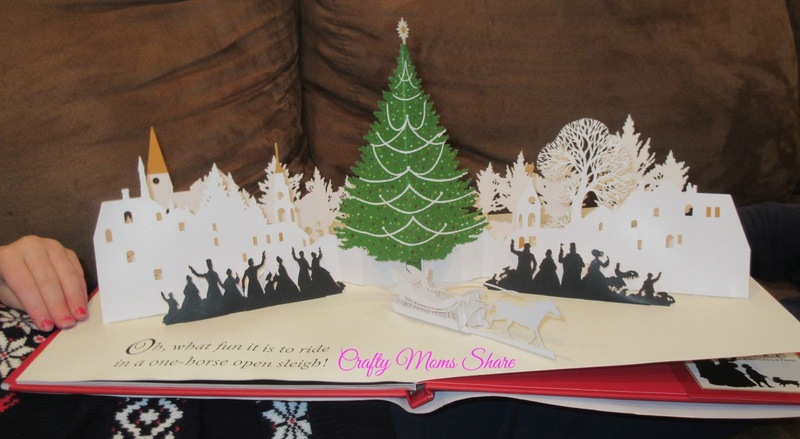 It is a tree with cut-outs on both sides of the page. The colors in the book are black and white with highlights of red, green and gold. Then the final page is a pop-up and is beautiful!! The cut-out pictures of the previous pages are in this pop-up. Can you find the tree? 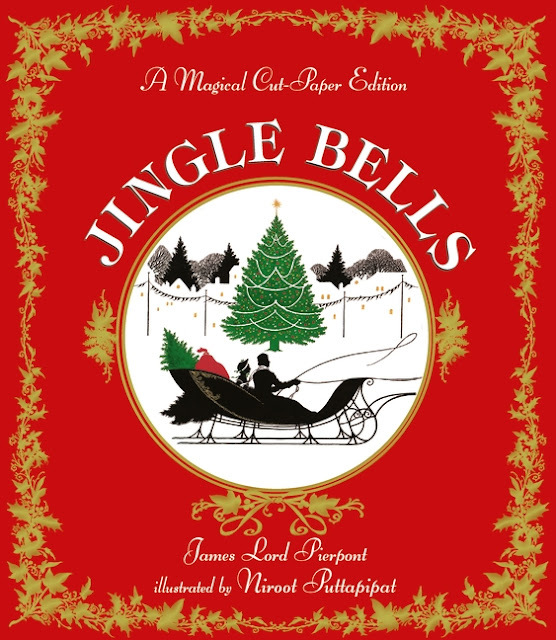 Now I have to admit Hazel and I sing Jingle Bells all year round and we do not always remember the correct words so when I saw this book I knew she would love it. Now she can read the words whenever she wants to and it inspired her of course. 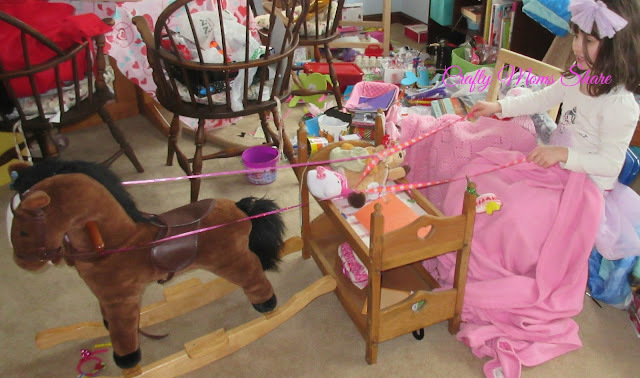 She made her own one-horse sleigh. We added some jingle bells to the reigns. She now sings the song while playing in her sleigh. Yes we are having a lot of fun with this book!! 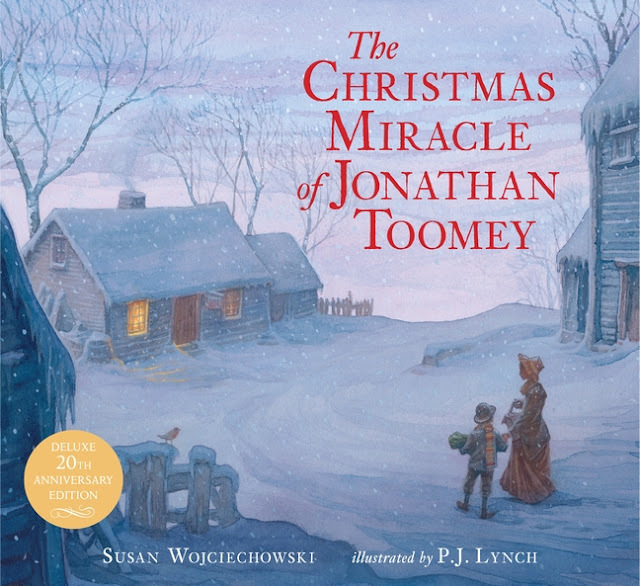 Our next book is The Christmas Miracle of Jonathan Toomey by Susan Wojciechowski and illustrated by P.J. Lynch. This story tells of a widow, Jonathan Toomey, who moved away after his wife and child died. He went far away to where no one knew his story. He was always grumpy and the kids in the village called him Mr. Grumpy instead of Mr. Toomey. He was known as the best woodcarver in the region. One day a widow and her son Thomas showed up at his door. The widow lost her beloved nativity set that her grandfather had carved many years prior in her move to the village. She asked Mr. Toomey to make her a new one. Over the period before Christmas Thomas and his mother visit Mr. Toomey and Thomas asks Mr. Toomey to let him watch him work since he would like to become a woodcarver eventually. Over time Mr. Toomey begins to show a little kindness and love towards Thomas and even teaches him to begin to carve. On Christmas Eve the set is still not finished but the widow and Thomas show up with some gifts for Mr. Toomey. He claims not to want them but they leave them anyway. I will leave the story there so I do not spoil the ending. 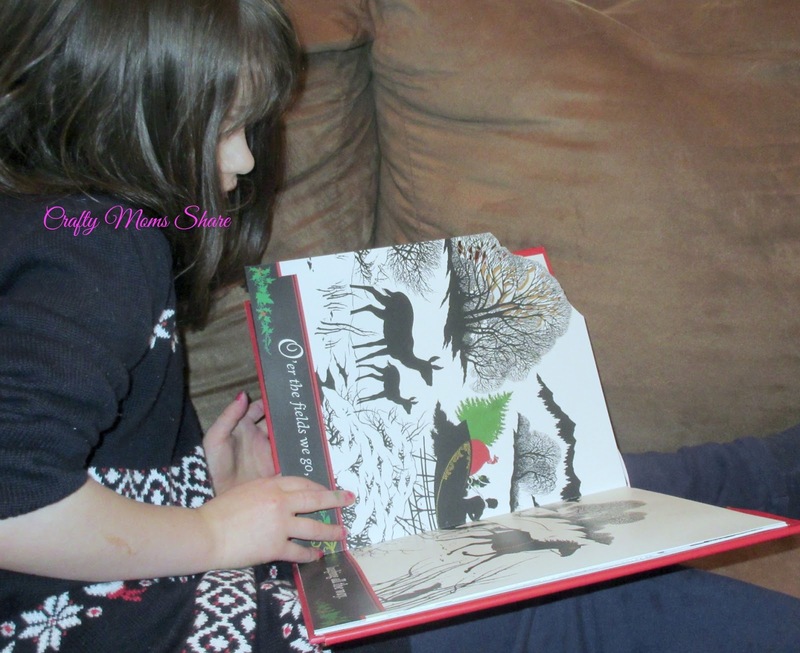 It is a wonderful reminder of the power of Christmas and we really enjoyed this book as well. The pictures are beautiful and the story is a feel good one. Our final book is Certain Poor Shepherds: A Christmas Tale by Elizabeth Marshall Thomas and illustrated by Jonathan Bartlett. 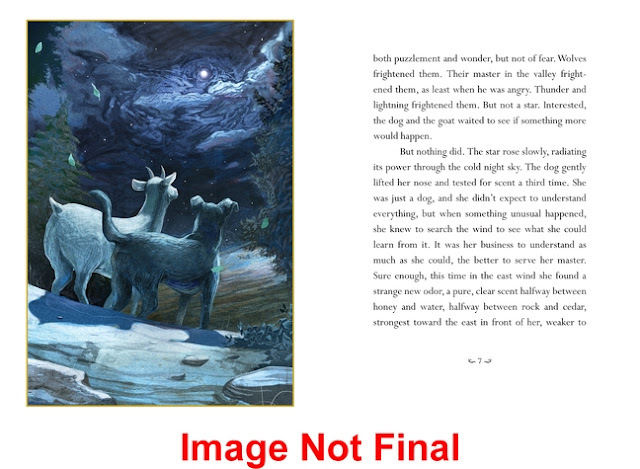 This book is an illustrated chapter book for kids in the middle grades (3-7). It tells the tale of a goat and dog who a man uses as his shepherds for his flock of sheep. The book goes back and forth between the view of each animal, Lila the dog and Ima the goat. They have quite an adventure when they notice an overpowering star that the animals cannot seem to stop staring at and seems to draw them to it. They go off and follow the star. The sheep follow their shepherds. There are many adventures for the animals. They see and help angels. Lila goes off and meets more dogs and sees Baby Jesus. It is such a different view of the Christmas story. It puts animals in such a strong light. Imagine a dog and goat working together to keep a flock of sheep safe and together. The views of the animals without vocal communication is amazing as well. It really makes you think about what they are really thinking. 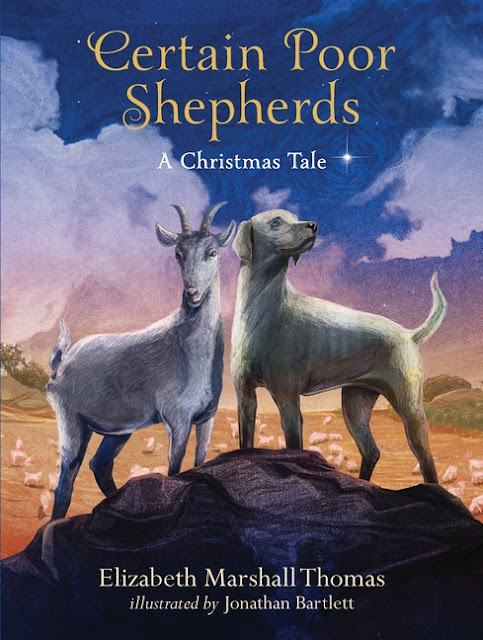 The story brings aspects of the Christmas Story into it with a different spin that I have not read other places. There is a picture in each chapter and they are beautiful. I have been reading a chapter or two to Hazel each night and we are loving this story. I did read ahead so I could review it. It is a wonderful story that has happy endings although a bit surprising for each animal. 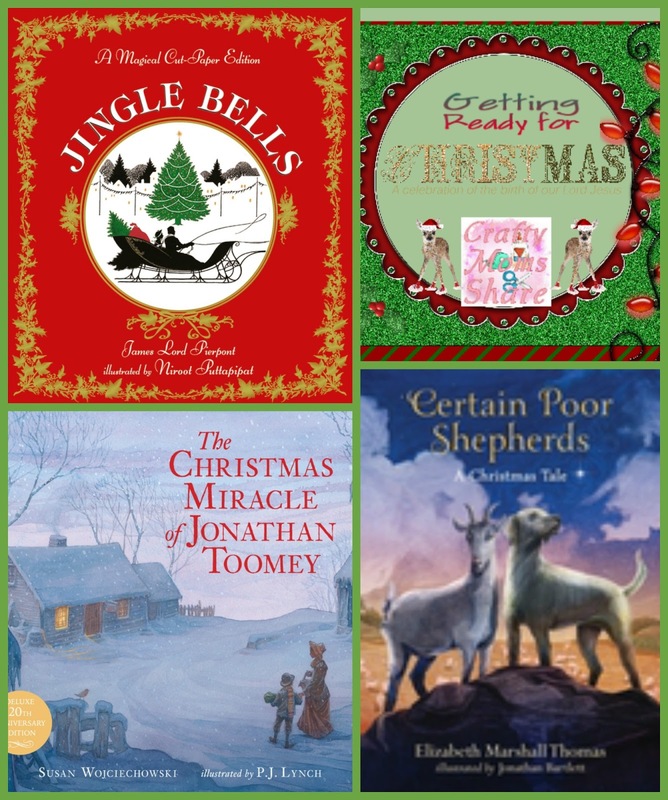 I hope you take the time to check out these wonderful Christmas stories and wish all celebrating the merriest Christmas!! I hope Jesus' Peace and Love are with you and your family this season and upcoming year! !